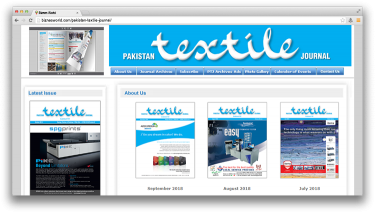 Description Pakistan Textile Journal is the leading monthly magazine for the textile industry of Pakistan for the last fifty eight years. We bring to our readers practical experiences and latest technical innovations in the fields of fibres both natural and synthetic, spinning, weaving, knitting, non-woven, embroidery, dyeing/ finishing printing of fabrics, garments and knitwear. Address B-4, 2nd Floor, Plot No. 64/21, Muhammad Ali Housing Society, Sindh, Karachi.